The second screening begins at 17.30 in the Högbom Lecture Theatre within Geovetenskapshus, Stockholm University. In addition, a sound piece by the artist will run concurrently in the room. At around 18.15 Hanna Ljungh and Professor Gunhild Ninis Rosqvist, Director of Tarfala Research Station, will take the floor to each explain their work with Kebnekaise, and explore the parallels and differences between artistic and scientific approaches to the subjects inherent in the film. We shall encourage lively discussion via questions and impressions from the audience after, then return attention to the film – hopefully be meditated upon with freshly provoked senses! It is a completely open event but please contact APECS Sweden or rsvp via Facebook if you wish to attend. Drinks and nibbles will be provided. 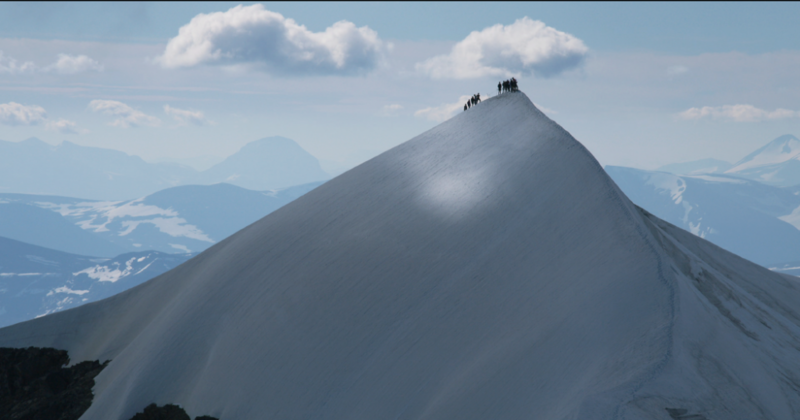 I am a mountain, to measure impermanence, features the southern peak of Kebnekaise, where a team of scientists gather samples and measure the effects of the rapidly melting mountain glacier over the course of a single day in 2015. Since 1902, when the first measurement was made, the southern peak of Kebnekaise has been the highest point in Sweden. However, 113 years of research shows a clear tendency that the glacier is melting. Consisting of rocks, Kebnekaise’s northern point will therefore, according to the statistics, soon be the highest peak in Sweden. Applying the term Anthropocene – a proposed geological term generated by the impact humans have had on the Earth since the industrialisation, Hanna Ljungh investigates the relation between human and non-human. Exhibiting winter 2016 at the ANNAELLE Gallery, Stockholm, Hanna installed with the film a sound piece utilising the scientific data of Kebnekaise’s yearly height as material. Reading the measurements aloud, then reducing the recording to an extremely low frequency, deep bass vibrations result. These earthly sounds are then measured in turn by a large-scale seismograph. Her voice is turned into the seismic curve that has similes to the light quakes emerging from inside the mountain whilst carrying detailed scientific information. Are you interested in sharing info about this event? Download the PolarWeek Invite and PolarWeek Poster. I fyou have questions, please, contact us at apecs.sweden@gmail.com. Find up-to-date info about the event at our FB event page. Hanna Ljungh works with film, photography and installation. She lives and works in Stockholm. Hanna Ljungh received a BFA from Parson School of Design, New York and a MFA from Konstfack, Stockholm. In the spring of 2015, Ljungh was, along with Henrik Håkansson and Åsa Sonjadotter, part of the group show D’ après nature at the Swedish Institute in Paris. Previously, Ljunghs works have been shown at Fotografiska in Stockholm, Studio Hippolyte in Helsinki, HIAP in Helsinki, Pohang Museum of Steel Art in South Korea and most recently at ANNAELLE gallery in Stockholm. interdisciplinary and international research collaborations, in addition to developing effective future leaders in polar research, education and outreach. APECS Sweden carries out APECS’ mandate on a local level by providing networking and career development opportunities for early career researchers in Sweden. International Polar Week is an week of worldwide outreach events organised by APECS to celebrate polar regions and promote the science undertaken by its members there. It is timed to coincide with the spring equinox. Gunhild Ninis Rosqvist is a professor at Stockholm University Department of Physical Geography and Quaternary Geology and director of Tarfala Research Station, whose research concerns climate change’s impact on alpine and polar regions with focus on snow, ice and water. Tarfala is part of the EU funded infrastructure project INTERACT and is responsible for the measurement of Kebnekaise.